We are the leaders in manufacturing, trading, distributing, wholesaling and supplying an extensive qualitative range of Wooden Deck that is used as outdoor flooring areas such as terraces, balconies, swimming pools. 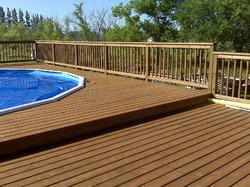 The offered wooden deck is widely demanded among customers for its durability and wear and tear resistance. This wooden deck is checked in terms of quality so as to supply a perfect range from our end. Note : Product price range from Rs 40 to Rs 400 Per square feet. Amidst our wide range of products, we are also engaged in offering Outdoor Deck Wood Flooring. Available in shapes, sizes and patterns, this wood flooring is known for its easy installation, easy removal & abrasion resistant. Offered wood flooring is made up of premium quality material in accordance with the market trends. In addition to this, our customers can avail this wood flooring from us at reasonable prices. Note : product price range Rs 200 to Rs 500 per Square fit. Looking for Wooden Deck Flooring ?